Hallowe'en is on Monday, which makes tomorrow our Hallowe'en market! Bring the kids in their costumes for treats at the door and RFM Kids' Club downstairs. 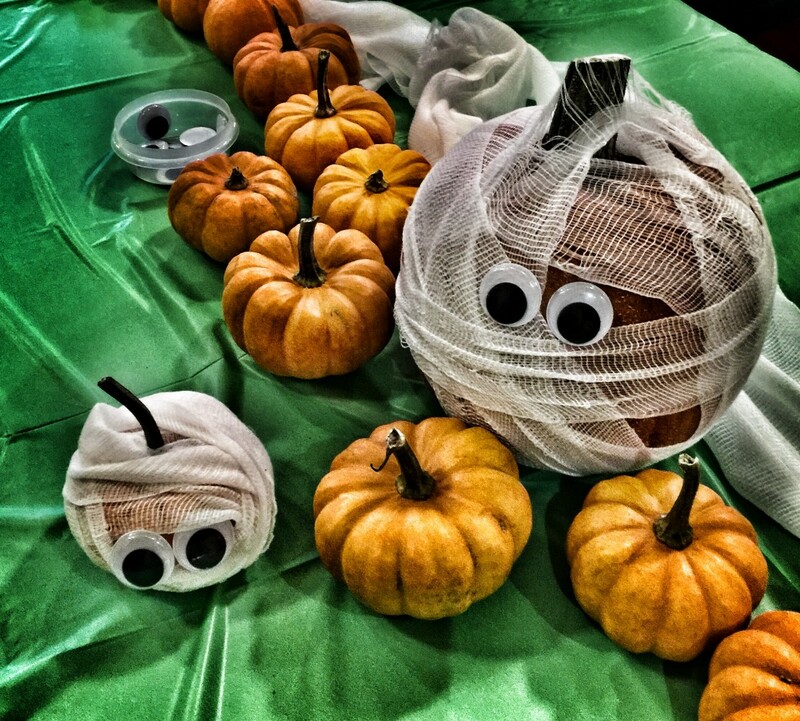 Mini mummy pumpkins are this week's Kids' Club craft, with pumpkins supplied by Floating Gardens and Frontier Gardens. It wouldn't be a Hallowe'en market without treats, so don't forget to dress up the kids and grab them a naturally-sweetened treat made by Nosh Artisan Edibles on your way in! Because you asked for it, a breakfast item has now been added to the Market Meals menu! Enjoy a Going with the Grain bagel with jam from Miller's By-Gone Farm and a cup of tea or coffee tomorrow morning. If you're looking for fresh produce, it's not too late in the season. Floating Gardens, Frontier Gardens, Heliotrope Organic Farm (outside), J9's Tiny Farm, Miller's By-Gone Farm, Rocky Acres Orchard, Stellar Gourmet Mushrooms, and The Garlic Garden will all be in attendance. Not all vendors are listed above; please refer to the complete Vendor LIST for tomorrow's market. For vendor locations on the upper or lower levels, see the Market MAP (2 pages! ).